ASHEVILLE — Western North Carolina wasn't the only part of the state hit by U.S. Immigration and Customs Enforcement raids last week. ICE arrested at least 40 people statewide, an official with the federal agency said Monday. The most recent raids took place over the weekend in Western North Carolina, where about 15 people were arrested in Buncombe and Henderson counties, ICE spokesman Bryan Cox told the Citizen Times. He was unsure of the exact number of people arrested. Immigrants' rights advocates reported that ICE agents had been seen in Asheville area Latino communities Monday but were unaware of any arrests. "People have been calling saying ICE is in the area here and in Asheville," said Bruno Hinojosa, who heads the immigrant advocacy organization Compañeros Inmigrantes de las Montañas en Acción, known as CIMA. 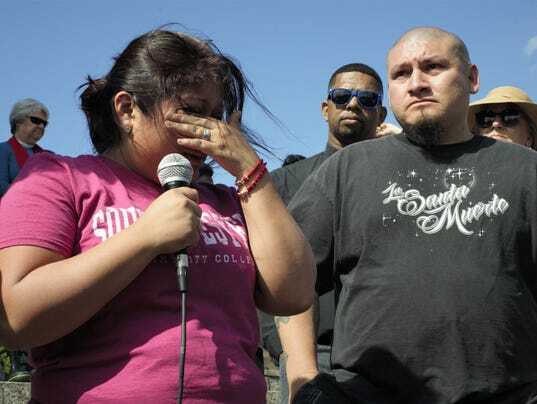 "People are intimidated and don’t want to come out of their houses, not even to meet their daily needs,” said Hinojosa, who spent Monday morning in Hendersonville speaking with the families of people arrested over the weekend. Cox, who is based in Atlanta, was unable to speak about arrests that took place on Monday, offering only that “ICE conducts targeted enforcement operations on a daily basis." "We make arrests every day,” he said. Cox confirmed ICE arrested about 25 people in and around Raleigh, Durham and Chapel Hill last week. He couldn't say whether federal immigration officials had arrested people in any other parts of the state, explaining that he can only confirm reports. 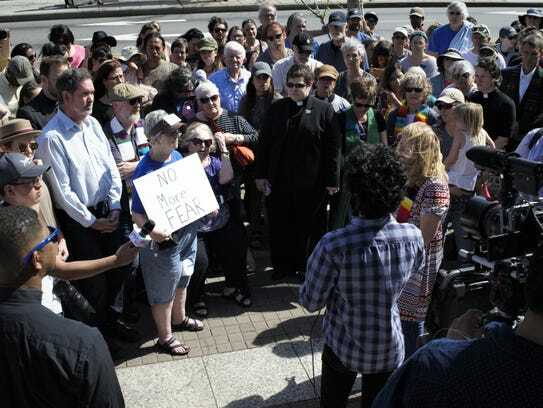 The ICE arrests got the attention of the American Civil Liberties Union of North Carolina, which condemned the statewide raids. Everyone ICE arrested in the Carolinas last week was charged with illegal entry, but most of the people who were arrested had been targeted because of past criminal activity, Cox said. "While all of those arrested are unlawfully present in the United States, the majority of those arrested also have criminal convictions or are illegal re-entrants," he said. ICE doesn't carry out "random or indiscriminate" arrests, Cox said, instead only targeting specific people who ICE agents know have criminal convictions. If, however, immigration agents come in contact with people in the country without documentation while pursuing those on their target list, ICE "won't turn a blind eye," Cox said. Though ICE policy doesn't officially permit agents to go door to door asking people for their immigration status, Hinojosa said that's still what ends up happening indirectly. Agents stop Latinos to ask them for the whereabouts of the people on their target list and then ask where they're from. If they give the wrong answer they end up in cuffs, said Hinojosa. ICE agents who encounter people in the country illegally while looking for people on their target lists are in compliance with agency policy, Cox said. This is why it's important for immigrants to know their rights, said Shoshana Fried, an immigration attorney with Pisgah Legal Services. Fried is director of nonprofit law group's Justice for All project, which aims to help people in the country without legal documentation. She and her colleagues have been getting a lot of calls since news of the ICE raids began to spread over the weekend, Fried said. Fried said that she's spent a lot of time informing people of their rights, namely that they don't have to consent to searches nor do they have to talk to ICE agents. "It's extremely difficult to know what your rights are, exercise them, and do that all in a language you may not fully understand," she said. "The big thing is somebody can exercise their rights and still get detained, so I can't stress enough how important it is to call an attorney as soon as a friend or family member is arrested. In these cases, time is of the essence." ICE sometimes quickly relocates its detainees, complicating matters, Fried said. That could be the case with some of the people arrested over the weekend. Cox said that he doesn't know the whereabouts of everybody arrested in North Carolina during the past week. Because ICE doesn't have any detention facilities in the Carolinas, agents typically transfer immigrants to one of four detention centers in Georgia. ICE's website has a detainee locator feature, which allows people to find their loved ones. Judy, southBronx and Beezer like this. Don't break YOUR family apart. Pack up like going on a happy vacation BACK to your home land. No more sob stories, have some dignity...say thank you for what you stole from our country and go build America on YOUR soil. Your welcome...well not really...but please go and get on with your criminal lives in your country. “It’s really shameful to see the Trump Administration spending federal resources to terrorize immigrant communities and break up families across North Carolina," North Carolina ACLU spokesman Mike Meno said. OH - 40 people out of 12 million, should we be thankful - NOT! NO PAPERS - NO STAY! Judy, southBronx, Beezer and 2 others like this. Yesterday Ice came to my grandson's high school in Hendersonville, NC. I asked him what people said about it. He said they were saying "they will be coming in here soon." I guess most of the Latino kids are anchor babies so they will have nothing to worry about. Hopefully, some of their parents will get picked up. Hendersonville and my grandson's school is full of Hispanics. Of course on the evening news, we saw several of them and their sympathizers holding up signs with their usual BS written on them. There was an outraged lawyer spouting off about how he was not allowed to see his clients. WHY DOES ICE SEEM TO BE APOLOGIZING FOR ARRESTING THESE LAWBREAKERS, and why are illegals entitled to legal services? ICE might have arrested three people, Three out of hundreds, BIG DEAL, JUST A DROP IN THE BUCKET. They need to start deporting these people ASAP. I AM SOOOO FED UP WITH THIS TRAVESTY OF JUSTICE - SO MUCH FOR A COUNTRY OF LAWS!! Judy, Beezer, Scott-in-FL and 1 others like this. It's absolutely disgusting the mess we've allowed to grow and breed in this country. Nauseating in my opinion. ANCHOR BABIES ARE CITIZENS OF THEIR MOTHER'S COUNTRY. If their citizens give birth on ANY foreign soil...then that child IS a citizen of the mother's country. NOW LOAD UP THE ILLEGAL ALIEN PARENTS AND THEY TAKE THEIR MINOR CHILDREN WITH THEM!!! They do not leave them on our doorstep like a box of unwanted puppies. Birthright citizenship is the elephant in the room... it is THE issue that if not dealt with, will continue to transform this country into a one party country. It is what brings illegal alien families here and what has kept them here for many years. It is responsible for much of the tremendous cost burdened upon American taxpayers, including increased property taxes for their education, increased heath insurance costs to pay for their health care , and competition in the colleges and universities for spaces that should be for American students. Ending it must happen, some way, some how . Scott-in-FL and Beezer like this.